Share these Veterans Day deals with a military veteran you love! The 9/11 Memorial & Museum will pay tribute to our country’s veterans during Salute to Service, a special five-day tribute honoring veterans, active-duty members of the military and their families. From Wednesday, November 8 to Sunday, November 12, the 9/11 Memorial & Museum will host a series of events and special programs for veterans and their families, as well as the visiting public. Throughout our tribute, veterans will receive free museum admission. Veterans will also receive half-price museum tickets for two family members during the tribute. Ticketing for Salute to Service will be available at a dedicated ticket table at the museum entrance. Programs taking place on the memorial are weather dependent. Military veterans and their families get free admission to the Lincoln Presidential Museum on Veterans Day. At 3 p.m., Medal of Honor recipient Al Lynch will speak and a special lapel pin will be offered to all Vietnam veterans. Reserve your free seat for this ceremony at bit.ly/ALPLMtix. The USAF Concert Band of the Golden West will be helping us kick off Veterans Day Weekend with a free performance at the Museum! Come out to celebrate our veterans and enjoy some amazing live music from 7:00pm – 8:30pm. And, if you make a donation to the museum you’ll get access to our amazing Air Park and Exhibit Hall! Bring the whole family. Seating is limited, so get your tickets soon! The Albany Institute of History & Art will offer free admission to the galleries on Monday, November 12, 2018 from 10 am to 5 pm in honor of Veterans Day. Veterans and military personnel who show valid service ID receive free admission on November 11, 2018. If you’re a veteran of the United States Armed Forces, we want to say thank you for your service to our country. So we’re offering veterans free admission to both of our world-class Christian themed attractions, the Ark Encounter and the Creation Museum, on Veterans Day, November 11. And please know that, with a current military ID, active duty members of the United States Armed Forces always receive a 20% discount off admission to either attraction for up to five general admission tickets. And retired members of the armed forces and veterans enjoy a 20% discount off their admission ticket as our way of saying thanks every day of the year. 2018 marks 100 years since the end of World War I so this year will have a special focus on WWI. Learn about the Spruce Production Division and the northwest's contributions to the war. If you have any WWI artifacts or exhibits that you would like to display that day, please contact the Museum. Free admission on Saturday, November 10 from 11am to 3pm. All veterans, active and retired military and their dependents will receive free admission on November 11 and 12. California State Parks is proud to honor our veterans & active/reserve military personnel for their service and sacrifices they have made for our country w/ free admission at 144 state parks on Mon 11/12 in observance of Veterans Day (w/ valid military ID). The Addison aviation museum celebrates its 25th anniversary with an open house featuring cockpit tours of aircraft, discounted flights and a Sherman tank demo. FREE admission for veterans on Nov. 10, 10 a.m. to 4 p.m.
All U.S. active-duty military, activated or drilling reservists, and National Guard personnel receive complimentary Single-day admission to Colonial Williamsburg for themselves and up to three direct dependents for any day, once a year. The offer is valid for one visit only. Cannot be combined with any other offers or discounts. Please present your active-duty ID and dependent ID to receive the offer. Active-duty military can either take advantage of the complimentary single-day admission for themselves and up to three direct dependents, or receive 50% off the purchase of up to five annual passes. Retired military and veterans qualify for 50% off single-day tickets or annual passes for themselves and up to three direct dependents. Military veterans who separated before retirement can bring a copy of their honorable discharge paperwork, DD Form 214, as identification of service. During Memorial Day weekend and Veterans Day weekend we offer free admission to all active-duty military, retired, veterans, activated or drilling reservists, National Guard personnel, and up to three direct dependents. Active-duty, activated or drilling reservists, and National Guard personnel, please select one complimentary day per year, total; either Memorial Day weekend, Veterans Day weekend, or another day of your choosing. On Sunday, Veterans Day, the Zoo will offer free admission to retired and active-duty military personnel, reserves and guard members during its "Veterans Free Day at the Zoo." Veterans must present their military ID or other proof of service to get this admission offer. The offer will be available at the Zoo's entrance. Parking is $10. Free admission to the gardens with live music every afternoon. Offer only available at the ticket booth. Nov. 10, 11, 12, 9 a.m. to 5 p.m.
Veterans receive free admission to the Des Moines Botanical Center in honor of Veterans Day! On Veterans Day, both active military and veterans receive free admission to our Museums, and their immediate family members receive $2 off admission. Proper identification must be presented at Admissions to redeem military discounts. Florida State Parks will grant free entry to everyone on Veterans Day, November 11. Free admission for veterans, reserve and active duty and first responders plus one guest when you buy your tickets at the gate. A $2 discount is offered on up to 4 additional tickets. Nov. 9-11, 10 a.m. to 4 p.m.
Sunday, November 11th is Veterans Day! All veterans and active duty military get FREE admission and free parking with ID! Veterans, active-duty military and military reserve members will receive free admission to the Rutherford B. Hayes Presidential Library & Museums on Veterans Day, which is Sunday, Nov. 11. Hermann Park salutes our veterans! On Veterans Day, Sunday, November 11, 2018, all U.S. veterans and active duty military personnel can enjoy a free ride on the Hermann Park Railroad as our way of saying “thank you” for serving our country. The train will run from 10 a.m. to 5 p.m., weather permitting. Proof of military service is required. Veterans should bring their ID to the podium at Kinder Train Station to enjoy their complimentary ride. Veterans will also receive a 10% discount in Pinewood Cafe. All veterans and active-duty military personnel, and everyone in their vehicles, will be admitted free to Indiana Department of Natural Resources state parks, reservoir properties, state forest recreation areas and state off-road vehicle riding areas on Veterans Day, Nov. 11. Veterans and military personnel should present ID or evidence of military service where entrance gates are in operation. During Veterans Day Weekend, Montpelier says "thank you" to all active/retired military guests with a free House tour and Museum Shop discount. In honor of Veterans Day, we’re offering veterans and one guest free admission to our Museum, November 9-16. Active members of the military receive free admission year round. Kennedy Space Center Visitor Complex is offering U.S. veterans, active duty, retired and reserve military free admission and 50 percent off for up to three accompanying guests during Veterans Day weekend. This offer will be valid Friday, Nov. 9 through Sunday, Nov. 11, 2018. U.S. service members (veterans, active duty, retired or reserve) can pre-purchase tickets online for a visit on November 9, 10 or 11 OR purchase tickets on-site during Veterans Day weekend. Those participating must verify status either online through ID.me or in-person with an active duty military ID, retired military ID or DD 214 documentation to redeem the offer. FREE Skiing and Riding: Receive a FREE lift ticket on Veteran's Day 11/11/18 and Memorial Day 5/27/19 (if we're open for skiing and riding). All Active Duty, Retired and Honorably Discharged members of the U.S. Military are eligible for above discounts. Just present a valid U.S. Military or Retired Military ID, a copy of your DD214 form (photo ID required) or discharge certificate (photo ID required) at any ticket window. Active, Retired and Veteran U.S. Military Personnel may receive free admission to Knott's Berry Farm for themselves and one guest from November 1 - 15 and November 26 - December 21, 2018. Show your Military I.D card or DD214 at the Knott's Berry Farm main gate to redeem this offer. Additional discounted tickets may be purchased at the ticket booth. Restrictions apply. Spouses of deployed military personnel may receive complimentary admission and the option to purchase up to six additional discounted tickets by providing deployment papers. All veterans and active duty military members will receive free admission to the Liberty Aviation Museum on Veterans Day from 10am - 5pm. We are celebrating Veterans Day along with International Science Center and Science Museum Day on Sunday, November 11, 2018. Enjoy free general admission from 12 - 5 p.m. General admission includes 250+ hands-on exhibits, live stage shows, Spark!Lab from the Smithsonian, Kids Town gallery, STEM Playground space and more. Monticello is proud to offer U.S. military veterans complimentary admission to Monticello for Veterans Day Weekend, November 10-12, 2018. Admission is for the regular daily House Tour and Grounds Tickets. Mount Vernon admits FREE all active duty, former, or retired military personnel on Veterans Day. MOHAI is celebrating the 100th anniversary of the end of WWI, also known as Armistice Day. There will be activities throughout the day, November 11, for all ages to enjoy. We recognize the service of active duty military and veterans with free admission throughout the day. Free admission for veterans and active-duty. The arcade features dozens of vintage video games, consoles and artifacts. Pick up your ticket at the door. Nov 11 from noon to 5 p.m.
Veterans, active duty service members and National Guard personnel are invited to attend the New Mexico Museum of Space History in Alamogordo free on Veterans Day, Sunday, November 11. In carrying on a tradition to honor all those who serve, the museum includes law enforcement, firefighters and first responders to the list of free attendees. Admission to the museum for those personnel, their spouse and up to two dependent children will be free of charge on Sunday, November 11. The Newseum once again offers free admission to veterans and active duty members of the U.S. military, plus one guest. This promotion begins Saturday, Nov. 10 and continues throughout Veterans Day weekend, concluding on Monday, Nov. 12. FREE museum admission for military veterans November 10-12. On November 10 - 12, 2018 from 9:30AM - 3:00PM, all veterans and active-duty military get free admission, and their families get half-off general admission at the front gate. On Saturday, November 10, 2018 at 2:00pm, join historian Richard Franklin Donohue for a lively lecture and discussion about World War I memorials in Connecticut, with a special emphasis on Fairfield County memorials. General admission is free for veterans and active military. Each year on Veterans Day, Old Town Trolley Tours offers specials to all veterans, active duty military personnel and police officers*. Old Town Trolley Tours is teaming up with the VFW to provide our guests with remembrance poppies to remind everyone of the service and sacrifices our veterans have made to this country. This year, we’re offering FREE Admission to the following: Old Town Trolley Tours and American Prohibition Museum. Old Town Trolley Tours will take $1 from each ticket sold on Veterans Day to sponsor a puppy with Patriot Service Dogs. Patriot Service Dogs provides veterans with assistance dogs and we are proud to be partnering with them in sponsoring a dog. The USDA Forest Service will waive fees at day-use recreation sites in Oregon and Washington Nov. 10 - 11 in honor of Veterans Day. Patriot's Point Naval & Maritime Museum is offering free admission to all veterans on Saturday, November 10, 2018 and on Veterans Day, Sunday, November 11. From November 10 - 12, 2018 from 9:30AM - 4:00PM, all veterans and active-duty military get free admission, and their families get half-off general admission at the front gate. Free Admission to the Pro Football Hall of Fame for all veterans and active military plus one guest, during the entire month of November. Active duty and retired military personnel with a military ID card receive free admission in honor of Veterans Day. Six Flags Over Georgia is hosting Military Appreciation Days on Veterans Day Weekend, November 10 and 11. During this weekend, there will be complimentary admission for current (active) military members and up to three dependents. If a military service member is currently deployed during this day, a spouse and up to three dependents can receive complimentary admission with a current military ID card. Active service members can purchase an unlimited amount of additional tickets for family members or friends for 50% off plus tax per ticket. Veterans and disabled Veterans will receive one free admission ticket to Six Flags Over Georgia with a valid Military ID card and can purchase an unlimited amount of additional tickets for family members or friends for 50% off plus tax per ticket. Government Civilian and Contracted workers can purchase an unlimited amount of admission tickets for themselves, family members or friends for 50% off plus tax per ticket. All admission tickets must be purchased at the front gate to receive these special military discounts and a valid military ID card is required. Thank you veterans for your service and sacrifice. To show our appreciation, we are offering complimentary self-guided tours to all veterans and members of the military. Please present your military ID upon arrival. November 11, 2018 from 10am to dusk. On Veterans Day all guests receive free admission in honor of American Soldiers and their families. In honor of both active and retired military, entrance fees will be waived for all day users on Sunday, November 11th, 2018 (Veterans Day). Standard facility fees and camping/overnight fees still apply. Upon arrival, check-in at Headquarters is still required. Join us Sunday, November 11, for special military programming at the Alamo including firing demonstrations, living history, and free tours and giveaways for all military and veterans. From November 9 - 11, veterans & active military members can enjoy free admission to The Hall with proper military I.D. Admission to the National WWI Museum and Memorial is free for veterans and active duty military personnel, while general admission for the public is half-price Friday-Sunday, Nov. 9-11. These discounted rates are only available on-site at the museum's ticketing counter. This Veterans Day, Thinkery will offer FREE admission to veterans and active military personnel this Sunday, November 11! Family members will receive our Capital One Military Discount of $2 off per family member, up to five family members. The U.S. Army Corps of Engineers (USACE) will waive day use fees for veterans, active and reserve component service members, and their families at the more than 2,800 USACE-operated recreation areas nationwide on November 11 and 12, 2018. To discover a USACE recreation site nearest you, please visit www.corpslakes.us. Celebrate veterans with the USS Midway on Sat, Nov 10 & Sun, Nov 11! Washington State Parks offer free admission on Nov. 11 — Veterans Day. Free zoo admission on Veterans Day for active duty military, veterans and their spouses. All active duty, reserves and retired members of the Armed Forces will receive complimentary admission to the World of Coca-Cola. ​On November 3rd, Neuroacupuncture practitioners across the USA will unite to offer a complimentary treatment to veterans suffering from PTSD, traumatic brain injury, concussion, ongoing physical pain, and other related symptoms. Grace For Vets is a united front of car wash operators that provide a FREE CAR WASH to veterans & service personnel each year on November 11 to honor their past and present service to their country. On Monday, Nov. 12, from 7:30 a.m. to 5:30 p.m., all veterans and military service personnel who provide a valid military ID card will receive a free full-service car wash (a $14.99 value) at any full-service Jacksons Car Wash location in the Valley or a free express wash (a $16 value) at Jacksons Express Exterior Car Wash located in Peoria. Free car wash for Veterans and Active Military at both of our locations on Veterans Day, Sunday, November 11! ATTENTION ALL VETERANS: Scheduling for our Veteran's Day Event is now open! Let us treat you to a day of pampering! You will receive FREE Dental Care, a FREE Chiropractic Adjustment, a FREE Haircut, a FREE Makeover, and a FREE Breakfast! You have gone Above and Beyond for us...let us go Above and Beyond for you! Call 815.398.6545 to make an appointment! Free Veterans Dental Day on Saturday, November 10 from 9am to 1pm. We will be providing free dental exams, radiographs, cleaning, fillings and extractions on a first come first serve basis. Registration begins at 8:30. Services reserved for those without dental insurance. This year’s event will be held on Friday, November 9 at Lowrance Dental, 1350 Summer Lee Drive in Rockwall. The clinic will close to regular customers and attend to the eligible veterans by appointment all day Friday from 7:30 a.m. to 4:20 p.m.
Rockwall’s Terry Fisher American Legion Post 117 is collaborating with Lowrance Clinic to assist in scheduling and administration tasks. Mark Kipphut, Post Commander, announced that the Legion will start taking appointments on October 22nd at 8 a.m.
Partners in Dental Care is hosting a FREE dental care event for veterans. When: The event is from 8am-2pm on November 2, 2018. Where: 2565 Forest Hills Avenue, S.E. Suite 200, Grand Rapids, MI 49546.
Who: Veterans in need of dental care. What: Free cleanings, fillings and simple extractions available on a first come, first served basis. Stop by White Lake Family Dentistry by November 2nd with your DD214 to be put into the lottery. Veterans can float for free (60 min session) at either our Powell (393 W. Olentangy St.) or Easton (4185 Weaverton Lane, across from the Container Store) location on Sunday, Nov. 11 by appointment only. Call 614-798-TRUE to book, first come-first serve. Floating has proven to be effective on helping with PTSD and many other ailments. Tune up: Guitar Center is offering a free restring to all active and retired military members, who present their military ID. (**Guitar Center Repairs locations only). Savings Year-Round: for retired and active military at Guitar Center locations chain-wide will not stop this Sunday. In fact, as a ‘thank you’ for their service, active and retired military receive 10% off in-store year-round. Everyone Saves: And not to be left out, this Sunday-only, everyone saves at Guitar Center this Sunday, November 11 with a 15% off Veteran’s Day savings coupon. VETERANS & CURRENT MILITARY MEMBERS -- Visit a U.S. Great Clips salon on Nov. 11 receive either a free haircut that day or the free haircut card to use at a later date. Purchase a service at a U.S. great Clips salon on Veterans Day (Nov. 11) and get a free haircut card to give to a veteran you know. Haircut Cards are redeemable until December 31, 2018. Hair Club®, the leading provider of total hair solutions in North America, is celebrating Veterans Day by providing free haircuts* to veterans during the month of November. In addition, the company is offering half price off select hair restoration solutions** to all veterans, active military and first responders, including Police, Fire and Emergency Medical Services (EMS). This Veterans Day 2018, Hair Cuttery is giving back to former service men and women through its Share-a-Haircut program. Chances are you know someone who is a veteran. Maybe it’s your mom or dad, your spouse, your child, your neighbor, coworker, or just a friendly face you encounter in your day-to-day life. They’ve sacrificed so much just so we are free to live our lives. At Hair Cuttery, we want to honor that sacrifice in our own way – with Share-a-Haircut. On November 11th and 12th, every time an adult’s haircut is purchased at any participating Hair Cuttery salon, we will donate free haircut certificates to veterans through agencies in our local communities. On Veterans Day, November 11, participating Sport Clips locations will offer free haircuts to active duty military and veterans (with valid ID). The B&Bs for Vets program has been running for over 11 years. Over the past eleven years thousands of B&B’s and inns across the United States and Canada have offered active and retired veterans free lodging for one night on or around Veteran’s Day. This program was started by Kathleen Panek, a West Virginia Innkeeper in 2008, and was appropriately named B&Bs for Vets. Once again this year, the Association of Independent Hospitality Professionals (AIHP) will manage, coordinate and publicize the B&Bs for Vets program to honor our hard working military. The innkeepers participating in the 2018 B&Bs for Vets program will offer a minimum of one room for one night and totally free. 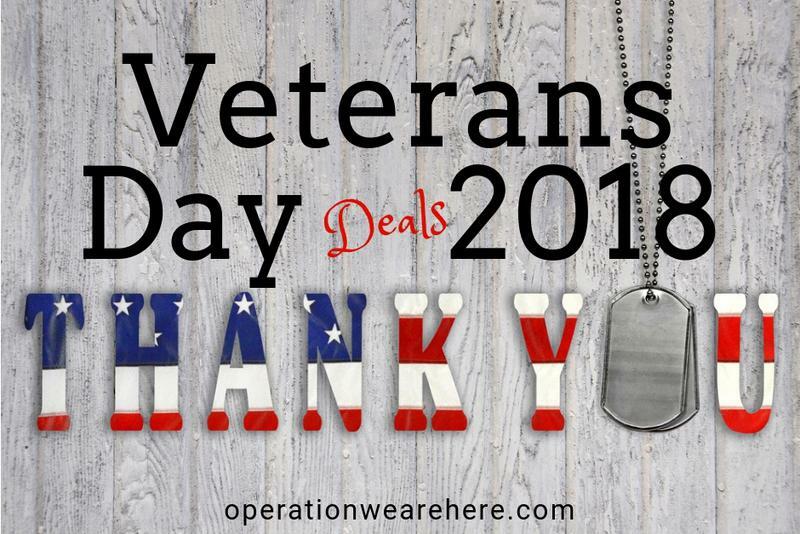 Most innkeepers will give their free rooms away on Saturday, November 10, 2018 so veterans can wake up at a B&B and enjoy Veteran’s Day activities on November 11th, but offers do vary. Some innkeepers may offer more free nights – this will be noted in their descriptions. Other innkeepers may offer different dates. It’s up to the individual participant. ​For Veterans Day this year, Connecting Touch Therapy & Wellness Center, Inc. will again be giving free half-hour massages to U.S. Military Veterans. However, because Veterans Day falls on Sunday, we will be giving the free massages on Monday November 12. If you are a veteran or know of a veteran, have them call 330-945-9354 to schedule their free ½ hour massage. In observance of Veterans Day, on Monday, Nov. 12, 2018, free tickets will be presented to all U.S. veterans, active-duty service members and their spouses for Universal's First Man at more than 60 Cinemark locations nationwide. Veterans and service members with a valid, government-issued VA or military ID will receive up to two tickets to see First Man at any Cinemark location playing the film. To determine if First Man is available at your local theatre, visit cinemark.com. First Man, from Academy Award®-winning director Damien Chazelle, stars Ryan Gosling as astronaut Neil Armstrong. FREE oil changes for Veterans on Friday, November 9th and Saturday, November 10th! Call or schedule your appointment online at any Thayer Family Dealership! Up to six quarts of semi-synthetic oil. Diesel excluded. Good at all of the Thayer Family Dealerships! Jiffy Lube service centers are independently owned and operated so each service center determines its own deals and promotions. Give your nearest service center a call to find out if they are offering a free oil change this Veterans Day. Meineke is offering a free basic oil change for veterans and active duty military November 12, 2018 only at participating locations. This Veterans Day Goodyear Auto Service and Just Tires locations nationwide are showing thanks and appreciation to those who serve and have served by offering all active and retired military members and first responders free "Checks for Vets," plus up to 10 percent off tires. Effective Nov. 9-11, the "Checks for Vets" promotion includes free tire, brake and battery checks. Military members and police, fire and paramedic first responders who present a valid ID will receive 10 percent off tires (Goodyear, Kelly or Dunlop brands). Appointments can be booked online beginning Nov. 9 – during the in-store promotional period – through Nov. 16 to be eligible for the offers. Veterans ride free on Sunday, November 11, 2018. Iowa City Transit is offering complimentary rides to veterans and their families on Monday, Nov. 12, 2018, in observance of Veterans Day, which is Sunday, Nov. 11. Riders are asked to show a military ID or other identification that indicates veteran status. Rides will be available on fixed-route City of Iowa City buses and Johnson County Seats. Jefferson Lines is proud to announce its Fourth Annual Free Veteran Travel on any Jefferson Lines schedule for all active military members and veterans in honor of Veterans Day this November 11, 2018. To thank and honor our veterans, Omnitrans is offering free rides to the men and women who have served in the United States Armed Forces on Sunday, November 11, 2018. To honor our nation's heroes on veterans day, we will be offering free rides (up to 10 miles) anywhere in the immediate KC metro area. Valid military ID required. Limit one free trip per person. Call 816-974-3379 to book your appointment. Rides needed for over 10 miles we are more than happy to do as well. Per mile charge of $1.50/mile will begin after 10 miles. Active military and veterans can ride the bus for free on Veterans Day. Riders presenting the appropriate identification card from any state will be allowed to board for free. SARTA is offering free rides from November 9th to November 15th for Veteran’s with proof of service. We do not offer service on Sundays so we couldn’t just offer free rides on Veteran’s Day but instead decided to go with a weeklong campaign. To show our gratitude, all veterans are invited to ride the South Shore Line for free through the weekend of November 9-11, 2018, and on Veterans Day (November 11), observed November 12. As train personnel walk through the train, please let them know that you are a veteran or active military personnel, and they will provide you a ride at no charge. No identification will be required. Up to three children 13 years of age and under may ride free with each veteran on off- peak weekday and all weekend trains. Brides Across America nationwide event dates November 2018. It is recommended that you call ahead to see if your local restaurant is participating in these offers. In honor of Veterans Day, all military personnel who have served past & present may receive one free lunch buffet on Monday, November 12, by presenting military ID at the Heritage Buffet. Veterans and active duty military eat a free meal at Applebee's on November 11, 2018. Arooga’s Grille House & Sports Bar is saluting America’s veterans with a free meal on Monday, November 12, 2018 in observance of Veterans Day all day at all locations (excluding Patchogue, NY). This Veterans Day – Sunday, November 11 — Back Yard Burgers is offering a free Back Yard Classic Burger to all active duty service members and veterans who show their military ID, discharge papers, proof of service or are in uniform. No purchase is necessary for veterans to get this complimentary burger. In honor of Veterans Day, active duty military and veterans can enjoy a FREE breakfast* on Sunday, November 11, 2018. Veterans and active duty members can select from three Buttermilk Pancakes, three slices of French Toast or one Belgian Waffle. And, on that same date, all veterans and active duty members who dine with us will receive a 20% off the entire check coupon** valid for their next visit. Just present a valid military ID to your server when ordering. From open to close on Sunday, November 11, every Bar Louie throughout the country will offer veterans and military personnel a free burger or flatbread up to a $15 value when they show a valid military I.D. On Veterans Day, veterans and active-duty service members who present a valid military ID will receive 10 percent discount. Veterans and active duty military personnel are invited to The Buffet for a complimentary meal! Join us on Sunday, November 11 for breakfast, lunch, or dinner. Veterans and active duty military eat free at Malone's, Harry's and Drake's from 11am-4pm on Veterans Day, November 11. On Veterans Day (Sunday, November 11), all service members can enjoy a complimentary entree up to $12.95, plus a free Dr Pepper beverage, by presenting a military ID or proof of service at any BJ’s Restaurant & Brewhouse nationwide. Offer is valid on Sunday, November 11, for dine-in guests only at BJ’s Restaurant & Brewhouse locations and is limited to one entree and Dr Pepper beverage per person. In addition, beginning November 1 and throughout the month, current and retired military can reserve a free Pizookie® as part of the restaurant’s “Buy a Hero a Pizookie” program. Black Angus Steakhouse salutes veterans and active duty military with a $9.99 All American Steal Plate on November 12, 2018. Veterans and Active Duty Military, this Veterans' Day your meal is on us*. Join us on Sunday, November 11, 2018 and we'll treat you to one of six favorite entrees. *One free item from this menu only valid for Veterans and Active Duty Military personnel on November 11, 2018 at all Bob Evans Restaurants. Not valid with other offers, discounts or coupons. Dine-in only. Bombshells Restaurant & Bar will provide free meals and soft drinks for veterans of any branch of the U.S. Armed Forces and 20% discount on meals and soft drinks for accompanying family members, on November 12. All Bombshells are open 11AM to 2AM for lunch, happy hour, dinner and late night. Veterans and active service members always receive 20% discount on meals and soft drinks every day at Bombshells. Buy one individual meal and drink and get an individual meal free (with coupon). On Veterans Day this year (November 11), participating Buffalo Wild Wings restaurants will offer free small boneless or traditional wings and fries for all veterans or active-duty service members to show appreciation for their service. The offer is for dine-in only, and a valid military ID is required for redemption. All veterans and active military receive a complimentary meal on Monday, November 12, 2018. On Sunday, November 11, California Pizza Kitchen invites veterans and active military to enjoy a complimentary entrée from a special Veterans Day Menu at all participating restaurants nationwide. Free meal on November 12. Free spaghetti feed on Sunday, November 11 from 11 AM to 2 PM in the Valley Ballroom. All veterans and one guest. In honor of Veterans Day, November 11th, Cattlemens Steakhouse is inviting all active, inactive, and retired military personal to enjoy a complimentary 8 oz. Sirloin Steak dinner. CentraArchy restaurants once again offers veterans their service. Any U.S. veteran or active duty military member is invited to enjoy a FREE entree Sunday, November 11, at any CentraArchy restaurant location. Visit *New York Prime, California Dreaming, The Tavern at Phipps, Chophouse New Orleans, Carolina Roadhouse, Joey D’s Oak Room, Chophouse ’47 or Gulfstream Café on Sunday, November 11, 2018 with a valid military ID or proof of service to enjoy a free entrée from the regular dinner menu (excluding AQ items, Porterhouse, alcohol and tax, dine-in). Chipotle Mexican Grill is offering a special buy-one-get-one (BOGO) promotion from open to close on Veterans Day. The BOGO promotion will be available for all active duty military, reserves, national guard, military spouses and retired military with valid ID, at all restaurants in the U.S. from open to close on Veterans Day. The offer is valid on burritos, bowls, salads and taco orders. This promotion is valid on in-store purchases only and may not be combined with other coupons, promotions or special offers. Limit one free menu item per military ID, subject to availability. Free item requires purchase of an entrée item of equal or greater value and is to be collected by valid ID holder only. Claim Jumper Restaurant & Saloon is offering military veterans a free meal on Monday, November 12, 2018 at participating locations. Dine in only. Coffee Beanery would like to invite our country's veterans and active duty military this Veterans Day, Saturday, November 11th to enjoy a free tall cup of coffee. Country Cookin honors active, reserve, and retired military personnel on Troop Appreciation Tuesday (usually the Tuesday nearest Veteran's Day) by providing them with free meals. This Veterans Day, Cracker Barrel Old Country Store® will show its appreciation for the U.S. military by offering veterans a complimentary Double Chocolate Fudge Coca-Cola® Cake dessert. Veterans, join us on Sunday, November 11th and choose a FREE meal from our Veterans Menu! Available all day, dine in only. All active and former United States military personnel will receive a special 10% discount for the entire month of November at all Eat’n Park Restaurants. The discount applies to all guests on the active or former military personnel’s check. The discount is not valid with any other discounts or coupons; is not valid on gift card purchases or at smileycookie.com; and ends November 30. Proof of service is required. All a veteran or current service member has to do is dine at any El Torito, El Torito Grill, Acapulco, or Chevys restaurant on Sunday, November 11, 2018, and have with them a valid ID, and they will be served a meal free of charge at any time from 3pm until closing time. The offer is not available during brunch. On Sunday, November 11 and Monday, November 12 in honor of Veterans Day, Famous Dave’s would like to thank all former and current military personnel for their dedication and service to our country by offering a FREE 2 Meat Salute*. 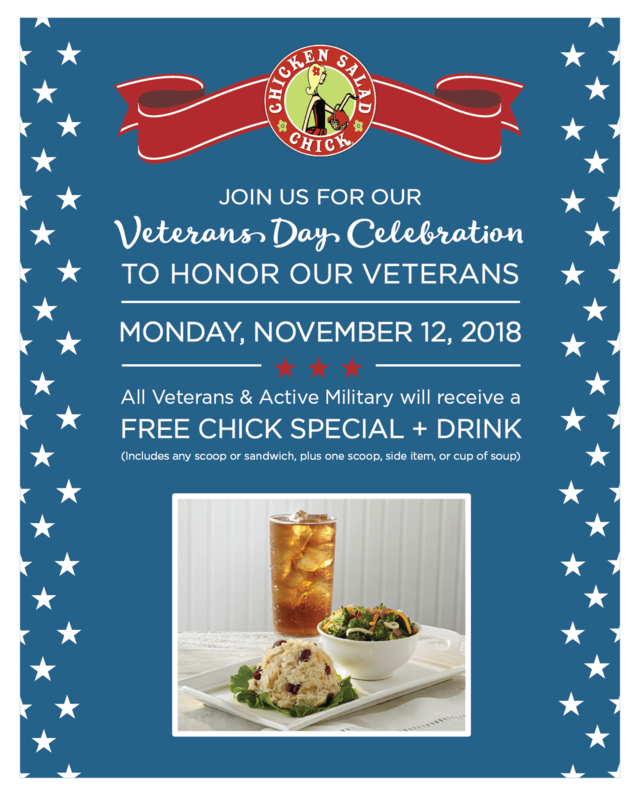 Fatz Southern Kitchen invite all veterans and active military to join us for a free World Famous Calabash Chicken® basket on the observed Veterans Day, Monday, November 12th. All veterans and active military can enjoy a complimentary World Famous Calabash Chicken® basket, which includes specially seasoned, buttermilk-marinated and hand-breaded Calabash chicken tenders served with steak fries with no additional purchase required. 54th Street Grill & Bar and 54th Street Restaurant & Drafthouse will be offering a free entrée for veterans and active duty military on Sunday, November 11, 2018. Dine with a Veteran or Active Duty Service Member on Monday, November 12 and their lunch or dinner is our treat! Reserve your table today. Please bring a valid form of military ID or wear your uniform to receive a complimentary entree. Friendly’s is treating veterans and active military to a free breakfast, lunch or dinner on Veterans Day, Sunday, November 11, 2018. Frisch’s Big Boy is offering a free meal to all veterans and active duty military on Veterans Day, Sunday, November 11. Please bring your military ID with you to validate your service. Free dinner buffet for veterans and military personnel on November 12, 2018 from 5-9 pm. Green Mill honors our military on Veterans Day, Sunday, November 11, 2018 with a free menu item for lunch or dinner. Offer includes any single item from our menu. Pizza restricted to a small one-topping Deep Dish. Offer is available for dine-in only. Hooters welcomes all active-duty and retired military to stop in for a free meal this Veterans Day as a “thank you” for their service. On Sunday, November 11, all veterans who present a military ID or proof of service and purchase a beverage at any participating Hooters location nationwide will receive a free entrée from the Hooters Veterans Day Menu (available for dine-in only). On November 12 from 11am-9pm, veterans and active duty military can eat at the soup, salad and dessert bar for free. Must show proof of military status and valid I.D. is required. Houlihan’s Restaurant + Bar will honor America’s veterans and active-duty military on Veterans Day, Sunday, November 11, 2018 with a complimentary entrée. The Veterans Day menu at Houlihan’s is comprised of guest favorites including the Houlihan’s Burger, Housemade Veggie Burger, Heartland Grilled Chicken Salad, Fish and Chips, Brentwood Chicken Sandwich, Southwest Grilled Chicken Wrap, Chicken Fettuccine Alfredo and a 5-oz. Petite Top Sirloin (the northeast Houlihan’s will offer the Down Home Pot Roast in place of the sirloin.) In order to receive a free meal on Sunday, November 11, 2018, guests will need to be in uniform or provide proof of military service which may include a U.S. Uniform Services Identification Card, U.S. Uniform Services Retired Identification Card, Current Leave and Earnings Statement, Veterans Organization Card, photograph in uniform, DD214, Citation or Commendation. Offer valid on Sunday, November 11, 2018 at participating Houlihan’s. Dine-in only from special Veterans Day menu. Not valid with any other offer. Beverages and gratuity not included. Limit one (1) meal per veteran or active-duty military. Huddle House is offering a free order of Sweet Cakes to all active duty, retired and veteran military members and veterans with proper I.D. from November 9—November 12. Many Hy-Vee stores celebrate Veterans Day each year by offering a free breakfast buffet to all veterans and active-duty military members as a way of thanking veterans and military members for their service. Hy-Vee typically serves more than 90,000 veterans and their guests each year at their in-store dining facilities or restaurants. Many stores offer planned programs, displays, entertainment or other activities to complement the breakfast event. This Veterans Day, JACK Cincinnati Casino will honor all active and retired US military personnel with a complimentary buffet. All US military personnel can redeem their complimentary buffet between 11 a.m. to 10 p.m. on Saturday, November 10, with a valid military ID. JJ’s Red Hots, famous for serving Charlotte’s best hot dogs and hand-crafted artisanal sausages, as well as exciting house-made sides and toppings, is offering a free combo meal to our nation’s veterans and troops (with valid ID) all day when Veterans Day is being observed as a federal holiday: Monday November 12, 2018. On Monday, November 12, participating Jon Smith Subs locations will offer a free 6-inch Steak Bomb sub to those on active duty or veterans in uniform. An ID will be required and no purchase is necessary. This Veterans Day, we will be offering a free lunch buffet for all veterans and active duty military personnel. On November 11, Kolache Factory stores nationwide are offering free breakfast to all veterans and all those who are actively serving our country in the U.S. armed forces. All veterans and servicemen and women are invited to come in and enjoy a fresh made kolache of their choice, savory or sweet, and a cup of coffee on the house. Little Caesars® Pizza is offering all United States Armed Forces veterans and active military a free $5 HOT-N-READY® Lunch Combo from 11:00a.m. to 2:00p.m, at participating stores nationwide this Veterans Day. This Veterans Day between 3–6 pm, all veterans and military personnel will receive a free meal from our American Roadhouse Meals menu (with valid military ID). Beverage not included. * *Not available in NC, SC, or Augusta, GA locations. Menu will vary at CA locations. One free meal from our $8.99 American Roadhouse Meals menu with proof of service. Beverage Not Included. Dine-in only. On Veteran’s Day (11/11) we’re excited to honor military with a free appetizer or dessert, no purchase necessary. Their entire table can enjoy 10 percent off their meal as well. To celebrate Veterans Day, November 11 and 12, Lucille’s is offering free dessert. On Sunday, Nov. 11, Main Event invites veterans and active-duty military to their nearest center for FREE food and FUN all day. All military personnel will receive complimentary $10 in arcade play that can be used on all Main Event arcade games, and can choose one entrée from a select menu. We're inviting you in on Veterans Day, November 11th, to receive one complimentary entree. We appreciate the sacrifice you make for our country and it would be our honor to serve you, so...sit back, relax, and enjoy the fiesta! *Must present valid Military ID to receive 1 free entree. Dine-in only. Cannot be combined with other discounts or offers. On Sunday, November 11, 2018, veterans eat a free 3-course combo (Best Cheeseburger in America) at participating Max & Erma’s locations. McCormick & Schmick’s Seafood Restaurants will thank U.S. military veterans and Gold Star family members by offering them a complimentary lunch or dinner on Sunday, November 11. Veterans and active duty military enjoy a free meal on Veterans Day, Sunday, Nov. 11. Menchie’s is offering all active and retired military personnel their first 6 ounces FREE this Veterans Day: Sunday, November 11. To claim the offer, military members will need to present a valid military ID at the time of purchase. In celebration of Veterans Day, Nékter Juice bar is giving free 16 oz Juices and Smoothies to Veterans and Active Duty Military all day long at participating locations. * We have almost 100 locations, mainly in CA, AZ, NV, TX, and CO.
Free entree from a limited menu at Olive Garden for active duty military and veterans on Veterans Day. Dine in only. This Veterans Day, Outback Steakhouse is continuing its rich history of honoring military members, thanking them with a free Bloomin' Onion and a Coca Cola beverage on November 11. Old Country Buffet®, Ryan's®, HomeTown® Buffet and Country Buffet® - and Furr's Fresh Buffet® are honoring veterans and all military this Veterans Day with a free meal at all their restaurants. On the observed Veterans Day holiday of Monday, November 12, 2018, veterans, active, retired and reserve military may enjoy a free buffet and non-bottled beverage at over 100 restaurants. The offer is available at participating locations while supplies last. Pilot Flying J is thanking those who serve this Veterans Day with a free breakfast. From November 10–12, active-duty and retired military veterans can redeem an offer in the Pilot Flying J app to enjoy a free Pilot Coffee of any size with their choice of a PJ Fresh breakfast sandwich, packaged pastry item or a Cinnabon Center of the Roll. Customers can get their free Veterans Day appetizer or dessert at Red Lobster on Veterans Day and the day after, on November 11 and November 12, 2018. Red Robin is inviting all veterans and active duty military members to enjoy a free Red’s Tavern Double burger with Bottomless Steak Fries on Veterans Day. Bring your favorite Veteran or Serviceman to RibCrib this Veterans Day for their Meal of Honor. Each meal comes with their choice of two meats and a side for FREE. See you on November 11th to celebrate! In honor of Veterans Day, on November 12, Rock & Brews is offering veterans, active military personnel and first responders a complimentary pulled pork sandwich or strawberry fields salad. Participating locations. Romano’s Macaroni Grill is offering a free Mom’s Ricotta Meatballs & Spaghetti entrée this Veteran’s Day, Sunday, November 11th at all of its 93 locations in the United States. All veterans and active military can enjoy this complimentary meal simply by presenting military ID or proof of service. Ruby Tuesday is offering veterans, active duty and reserve service members a free appetizer on Veterans Day. All veterans and active duty personnel receive a complimentary meal from a select menu on Sunday, Nov. 11th, 2018. Offer valid from 11am-10pm. Scooter’s Coffee is honoring active and retired military on Veterans Day (November 11) with free drinks of any size. Shane’s Rib Shack will honor active and retired members of the Armed Forces during their upcoming Military Appreciation Week, November 4th through November 11th. Participating Shane’s Rib Shack locations*, will provide military personnel with a complimentary sandwich, regular side, and 20-oz. beverage; offer valid November 8th through November 10th only. Military ID or proof of service is required. We've got a special promotion all weekend long for #VeteransDay! From 11/10 - 11/12, everyone can enjoy our Petite Top Sirloin & Eggs for ONLY $9.99! Each steak cooked to order. Served with golden hashbrowns & two-farm fresh eggs. *Valid 11/10/18 – 11/12/18. | Not valid with any other discounts or offers. | Dine in only. | While supplies last. To all veterans and active U.S. military, join us for a free breakfast from the fresh food bar until 11 a.m. on Monday, November 12th. We'd be proud to have you. Friday - Sunday, November 9-11, 2018, buy one and get one free (of equal or lesser value) for Veterans Day. Coupon required. Starbucks is offering veterans, active duty service members and spouses a free tall hot brewed coffee on 11/11 for Veterans Day! Valid at participating locations. 8th annual Superior Elks Lodge Veterans Day dinner & program November 9, 2018 is free to all veterans and significant others. sweetFrog will pay tribute to those who have served our country on Veterans Day, Sunday, November 11. All active and retired servicemen and women are invited to visit their nearest sweetFrog location with their military I.D. to receive a free 12-oz. yogurt. On Veterans Day veterans and active duty service members may choose one free entree from our special Veterans Day menu along with an iced tea, lemonade, or coffee. Sunday, November 11, 2018. Choose one of ten entrees. On Sun. Nov. 11 - Mon. Nov. 12, TGI Fridays is offering a free entrée up to $12 all day for current military members and veterans with valid identification, no purchase needed. Military members who dine with them on Nov. 11 and 12 will get the code “TGIVETS” at the bottom of their bill. Between Tues. Nov. 13 and Fri. Nov. 30, they will be eligible to order a free personal-sized appetizer with any online/to-go purchase of $20 or more. We want to thank our community of active, retired, and veteran military that join us at the Greene Turtle each day. We sincerely appreciate your service for our country. To honor you, Greene Turtle is serving up a FREE Entree up to $12 value, with valid ID this Veteran's Day. On Saturday, November 12 from 7-10am, The Landings at Reed Station Crossing would like to honor our local veterans for their service with a free, delicious breakfast! We would love for you, your family and your friends to join us as we celebrate our HEROES! Free smoothies to veterans at all corporate and participating franchise locations. White Castle is recognizing Veterans Day by offering a free Combo Meal to all veterans and active military members who dine in or visit the drive thru at one of the nearly 400 participating White Castle restaurants nationwide. The special offer is valid on November 11 and November 12. All veterans and active duty military receive a free chili dog, small fries, and a small Pepsi on Veterans Day at participating locations. On Sunday, November 11th, come in and choose from any Awesome Salad, Wild Wrap, Beefy Burger or Chicken Sandwich! Just Our Way of Saying Thanks for Keeping Us The Land of the FREE and Home of the Braveheart! All veterans and active duty military are invited to Wood Grill Buffet on Sunday, November 11, 2018, for a free breakfast from 8:00 a.m. to 11:30 a.m.
Christmas Decor has launched its 16th consecutive Decorated Family Program to transform the homes of servicemen and woman into magical winter wonderlands this holiday season. With more than 450,000 American men and women deployed overseas, the program is designed to boost spirits and spread cheer for military families across the nation who have to spend the holidays separated from their loved ones. Submit nominations for friends and family by November 11, 2018. Roof For Vets is exactly as it sounds. One deserving and needed roof will go to a veteran this November. Simply nominate someone you know or yourself. Winner will be announced November 11. Sleep Number wants to help military kids get the sleep they need. To celebration Military Family Appreciation Month, they’re giving away 12--yes, 12!--SleepIQ™ Kids beds. SleepIQ™ Kids beds come tricked out with features to help make sleep time a comfortable, safe, and inviting time for your child. Like adult Sleep Number beds, the SleepIQ™ Kids bed has an adjustable setting that you can change as your child grows. SleepIQ™ technology in the bed syncs with an app on your phone so you can see just how well and how long they’re sleeping. Your bookworm will love to tilt the head of the bed so they can read for hours, too. And did we mention that the SleepIQ™ Kids bed also comes with a gentle under-bed light that automatically turns on when your child gets up during the night? (For real!) No stubbing toes or tripping anymore! For the eighth year, Westgate Resorts and CEO David Siegel are proud to continue the company tradition of honoring our U.S. military personnel and their families by giving away free vacations. Mark your calendar for November 9, 2018 as we will open up registration for our event that will be held in May 2019. Avocado Green Mattress, makers of natural and eco-luxury sleep products, offers exclusive savings for those who serve our country in honor of Veterans Day. Verified military can save $225 on any mattress — made with natural and organic materials — purchased on AvocadoGreenMattress.com. This includes all active, reservist, discharged and retired US Army, Navy, Air Force, Marines, and Coast Guard personnel. To apply for verification, visit AvocadoGreenMattress.com/Service-Discounts or request a form using their website chat function. Discount is valid on mattresses only and cannot be combined with other offers. Offer valid through November 12, 2018. In honor of Veterans Day, Carnival Cruise Line, the line that carries that most active and retired service members, is offering special savings and bonuses in November to members of the U.S. and Canadian Armed Forces. The promotion, which provides up to $50 onboard credit per stateroom, a complimentary two-category upgrade, and 50 percent reduced deposits, can be combined with Carnival's highly attractive Early Saver rates*. In addition, guests who qualify for the promotion can book up to two additional staterooms with the same bonuses and pricing. The promotion can be booked from Nov. 5-12, 2018, and is applicable for a wide range of three- to 24-day sailings departing through 2021 from a multitude of North American homeports. Energy Ogre provides comprehensive electricity management services. We handle the selection of your electricity provider and enroll you in the best plan to save you the most money, and we even handle the renewal contract for your account. We use cutting-edge technology and mathematical algorithms to find the best possible plan for you. Our services are $120 per year but we are offering special savings for Veterans Day weekend. All veterans will receive our services at half price when they sign up using our promo code VETERANS DAY. On Monday, November 12th, active or retired military personnel are eligible for a 10% MVP discount off your total purchase. Individuals who have served or are currently serving in any official government-sponsored branch of the United States armed services and their immediate family members can get between 10 and 15 percent off the Hyatt Standard Rate at any participating Hyatt-branded hotel in the United States when booking the Veteran and Military Rate with offer code MILVET*. This is the first-ever veteran and military discount to be offered by Hyatt hotels. A valid U.S. Military/Veteran ID or other documented proof of service is required at check-in, and military personnel, veterans and immediate family members who are World of Hyatt members will be eligible to earn World of Hyatt points for their stay. The Hyatt House brand will also allow eligible military personnel, veterans and immediate family members to combine the Veteran and Military Rate with its upcoming holiday promotion, in which World of Hyatt members who stay for four or more consecutive nights at any Hyatt House hotel in the U.S. between November 1 and December 31, 2018 can earn 2,000 World of Hyatt bonus points. For full terms and conditions, please visit worldofhyatt.com/holiday. As a small way to show our gratitude, veterans, active military personnel, and their families are invited to save 10% on groceries on Sunday, November 11, 2018. This offer is valid for instore purchases only. We support our troops and our veterans. As a thank you for your service, we are offering the Home for the Holidays military discount for active duty and veterans. The Home for the Holidays rate is only available when you book online at redroof.com or by calling 800.RED.ROOF (800.733.7663) at Red Roof Inn, Red Roof PLUS+ and The Red Collection properties. Target is proud to offer a Veterans Day military discount from Nov. 4-12, 2018. All active duty military, veterans and their spouse and/or dependent children are eligible to receive a 10 percent discount on purchases in store and on Target.com (some exclusions apply; discount via single-use coupon). This Veterans Day, customers with a valid military ID or proof of service and their dependents will receive 15 percent off their entire purchase at Tractor Supply. This discount will be offered on Sunday, November 11 and will be available at all of Tractor Supply’s more than 1,725 locations nationwide. From November 9-11, 2018, customers with a Walgreens Balance® Rewards card and valid military ID or proof of service will receive 20% off regular price eligible store items* at any Walgreens or Duane Reade drugstore nationwide. Includes all veterans, military, and their families. Saturday, November 10 from 9:30 - 3:30. WOD for Warriors is held yearly on the 11th month, 11th day and 11th hour to celebrate the service of all U.S. military veterans in a meaningful way within their own communities. Salute those who have served during the Veterans Day Film Festival from November 10-11 at the Warner Bros. Theater in the National Museum of American History and the Lockheed Martin IMAX Theater in the National Air and Space Museum. Discover extraordinary stories about veterans and their families who have sacrificed all for our country and freedom. On Saturday, November 10, 2018, the famous Topanga Theatricum Botanicum will be the setting for our first US Veteran Concert entitled 'The Magic of Music'. The concert will feature US veteran singer songwriters from around the country, playing their own exceptional music compositions in front of a live audience. Whether the music is rock and roll, rhythm and blues, country western, or other popular music, this concert has it all. Livestream tickets are also available. The Commission is responsible for planning, developing, and executing programs, projects, and activities to commemorate the centennial of World War I; encouraging private organizations and State and local governments to organize and participate in activities commemorating the centennial of World War I; facilitating and coordinating activities throughout the United States relating to the centennial of World War I; serving as a clearinghouse for the collection and dissemination of information about events and plans for the centennial of World War I; and developing recommendations for Congress and the President for commemorating the centennial of World War I.